Fib-o-Meter Friday: More CC aligned Superintendents?! Last week, I put 3 state superintendents through the “Fib-o-Meter” to see where they landed with Common Core Standards. I had at least 4 requests for other state supers to be ‘put to the test’. So, here they are in alphabetical order per state: CA, NV, NJ, and NM. Mr. Torlakson didn’t have many written statements that I could find, BUT, he does like the video channel YouTube. Here’s a meeting he was featured in, from 07/14, “Reports from the Field”: http://www.youtube.com/watch?v=DQFsWiCxs1w Mr. Torlakson even acknowledges a member of the audience in helping champion this message. “Bottom-up, not top-down” Well, let’s see how bottom up translates on the “FoM”. ‘Neutral leaning toward Total Fallacy’ for this statement, why?! The RttT California application clearly lays out the state level commitment and support BUT it is conditional! See this excerpt from the Pioneer Institute which looked at CA’s application, “The study(Accountability Works) uses California, whose current (at that time, 2012)academic standards are among the nation’s best but has adopted Common Core, as an example. AccountabilityWorks estimates the Golden State will incur additional costs of over $1 billion for technology and support, $606 million for professional development and $374 million for textbooks and materials over seven years. The additional costs would exacerbate California’s recent budget woes, which have been even worse than what most other states have endured. (source: http://pioneerinstitute.org/education/study-estimates-cost-of-transition-to-national-education-standards-at-16-billion/, dated 02/12) Here’s what the CA RttT application stated: “California will strengthen its already high standards by adopting a set of common core standards and by working with one or more consortium of states to develop aligned assessments in mathematics and reading/language arts. This work will result in better data on annual student growth, including subgroup student achievement data, which will allow national comparisons, and will facilitate the identification and sharing of successful practices across the nation. The State has a well-established system for the development of curriculum frameworks and the adoption of aligned instructional materials, and will support the transition to new standards by accelerating the refinement of those frameworks and instructional material. The State will also invest in aligned interim assessments as a part of its instructional materials adoption process, to develop an item bank for formative assessments upon which LEAs can draw, and to support related professional development to help build the capacity to use data at the classroom and school levels. ” Further on, there’s this: “To date 804 LEAs representing 56 percent of the State’s schools and 3.6 million students (61 percent of whom are living in poverty) have signed MOUs committing to action in all parts of each of the reform areas …. and performance measures should we succeed in receiving a RTTT grant.” Link to the CA Race/Top Application: ( http://www2.ed.gov/programs/racetothetop/phase1-applications/california.pdf) Before we move on, STEM is another kingpin to adhering to CCSS & California committed to that back in 2008 via CA’s STEM Collaborative Action Plan. Don’t get how STEM and CCSS are connected? Read my post “PCAST, STEM and Common Core”. This also will make the ‘bottom-up, not top-down’, ‘Total Fallacy’. Another comment Mr. Torlakson made, “We have marketing to do.” Yes, as far as promoting the Common Core, I say he’s truthful on that one. (‘Total Truth’ is answer) HOWEVER, that, again is where the truth ends. Between his remarks and a ‘nifty’ video produced by pro CC supporters in CA, here some of the fallacies passed off as ‘truth’. The obligatory, ‘more rigorous, much deeper’, comments we know. One of the statements Ms. Skandera made in an interview featured here: (http://watchdog.org/21316/nm-core-beliefs-nm-education-chief-defends-common-core/) said, ““We’re not delivering on the promise of, ‘are you ready?’ We know half of our kids are not on grade level. 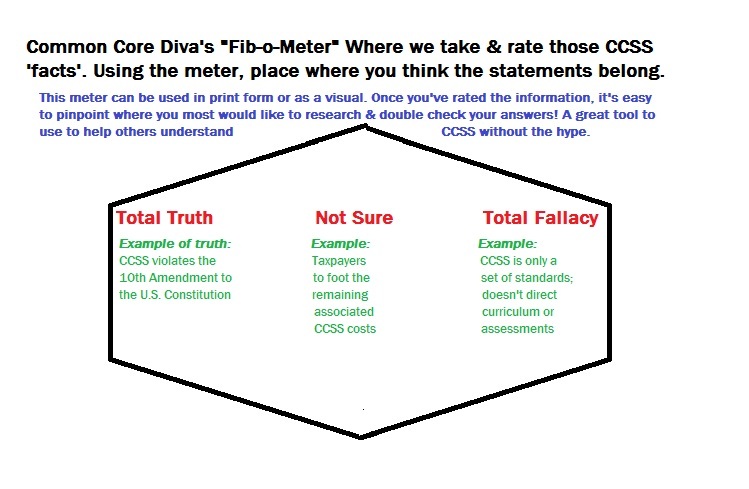 So (Common Core) is an important step to say, let’s make sure we have high standards.” On the “Fib-o-Meter”, this comment, while some bit of truth is present, would be “Total Fallacy” because if you already know your state is not making it, why not use the money for shaping up what you’ve got instead of ‘buying’ new?! So, if YOU have a state superintendent you’d like to see how their statements, activities fare on the “Fib-o-Meter”, be sure to leave me a comment. If you have any links, articles, etc. that would help in my research, I’d love that! Thanks!